The Ambani’s hosted a grand party for their son Akash Ambani and daughter-in-law Shloka Mehta’s engagement recently. The event turned out to be a star studded one as number of dignitaries from Bollywood and cricket attended the party. Among the visitors list of industrialist Mukesh Ambani from Bollywood were Aishwarya Rai Bachchan with daughter Aaradhya Bachchan, Shah Rukh Khan with wife Gauri Khan, Katrina Kaif, John Abraham, Aamir Khan with wife Kiran Rao, filmmaker Karan Johar. Cricketers including Zaheer Khan and Harbhajan Singh. Buzz is that Mukesh Ambani’s wife Nita Ambani personally invited Aishwarya’s daughter Aaradhya to the party. She requested Aishwarya to bring along Aaradhaya to the party. Interestingly, Aaradhya is also a student of Ambani’s school and Nita is the Founder and Chairperson of the school. According to the reports Nita informed Aishwarya that a small ballet was organised at the party in which kids were supposed to perform and she wanted Aaradhya to enjoy it. 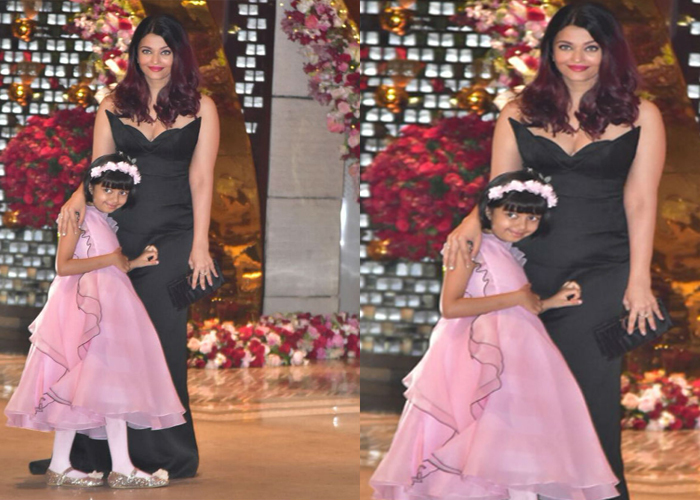 Aaradhya accompanied her mother at in the event and she wore a pink long frock with a matching hairband. Aishwarya was stunning in black ling body-fit gown. On work front, Aaradhya’s mom Aishwarya is busy in the shooting of Fanne Khan while Abhishek is shooting for Manmarziya.